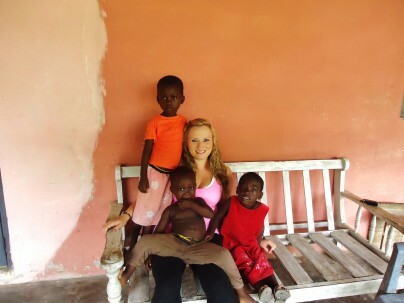 A reflection on her time in Ghana, Amizade intern Sara Wood recounts her third visit to Jukwa. As I sit down to write this blog I feel overwhelmed trying to formulate a post that accurately portrays my experiences serving with the community in Jukwa, Ghana. Writing about something that has had such a profound effect on your life – personally, academically, and professionally – is a daunting task. You want your readers to feel, see, and hear the same sights, emotions, and experiences that you felt. You want them to understand the connection you feel to the library, the clinic, your homestay family, and the community as a whole. You want to accurately answer the question you are asked on a regular basis, “Why go back to Ghana?” and this time you want to make them fully understand exactly why this is your third time traveling to Ghana with Amizade Global Service-Learning. Sitting in a Ghanaian restaurant, aptly named “Accra,” with a friend in New York City, I felt the familiar pull of Ghana. At that moment I knew, even before I consciously made the decision, that this summer, as part of my internship with Amizade and Master of Public Administration program at West Virginia University, I would return to Jukwa. Having previously participated in two Service-Learning programs to Ghana, accompanied by fellow students and faculty members, I welcomed the opportunity to experience the similarities and differences of serving as an Individual Volunteer and living with a homestay family. While I was familiar with the community of Jukwa and the logistics of traveling, this was the first time I embarked on the journey completely alone. Arriving in Accra, I felt a combination of excitement and nerves. However, as I exited the airport, Kwame from Peace Humanity International, Amizade’s partner organization in Ghana, rapidly dissolved my nerves and turned them into excitement with his ever positive and infectious enthusiasm. The next day, I was greeted by Amos, a member of my homestay family, as we dragged my luggage through a series of “tro-tros” to our destination. Pulling into Jukwa, I could not turn my head from the window as I took in the familiar sights and sounds of the community. 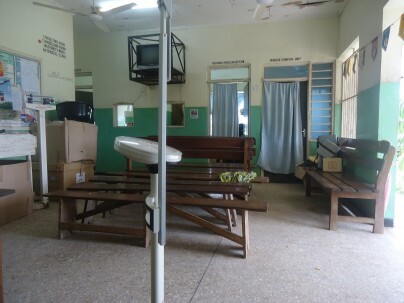 One familiar site, the Jukwa Health Centre, is where I volunteered during my six week placement. I worked alongside the Community Health Nurses who specialize in family planning and public health outreach. Every second, and this is not an exaggeration, literally every second I was learning. Not only was I learning about disease control, malaria, how to weigh babies, check vitals, fill out insurance information, or how to distribute vitamin A, I was also learning about traditional Ghanaian foods, social issues, and practicing my Azonto (a very popular dance in Ghana) with the help of the nurses. During slow days at the clinic, I learned just as much by talking with the nurses, sharing stories, and discussing Ghanaian and United States healthcare systems. When not learning at the clinic, I was learning at home with my homestay family. I shared a room with a nineteen year old female named Margaret. Anyone that says that real friendships and connections cannot be bridged due to cultural differences would instantly change their minds after spending five minutes with Maggie and me. Maggie and I tossed culture, religion, and every other aspect–that in some minds does not allow the creation of real friendships–out the window of our bedroom in Jukwa, Ghana. We respected and valued each other’s differences rather than allowing them to create a divide between us that could never be crossed. As I write this blog, I can hear her voice now saying “Sarrrraaaaa,” as she laughs at my lack of dance skills and my attempts at pounding Fufu (a very popular local dish). I am instantly transported back to sitting on the porch after dinner and laughing until we were near tears about chicken fried rice, food worms, cobras, and many other jokes we had accumulated throughout six weeks of new experiences that we shared together. During my six weeks in Ghana, I lived Jukwa. By that I mean I woke, washed, worked, and participated in all community activities as if I were truly a citizen of Jukwa and at all of these activities I was welcomed with open arms. So, “Why go back to Ghana?” Let me share a few of my favorite memories as a response to this question. Having the opportunity to see the almost completed library utilized by the clinic for an outreach program. Learning more in six weeks at the clinic than I believe I would learn in one whole year studying public health in the United States. Having a hands-on experience learning skills that were useful in helping the nurses and clinic staff on busy days. Hearing “Sara! We need you to fill out the insurance forms!” on an especially crazy day at the clinic, and actually contributing to alleviating a small portion of the nurses workload for one day. Learning and studying Twi (the local language). Having long conversations with my two house mothers, both of whom did not speak English, where I tried to utilize my Twi. Having a dozen children run into my arms greeting me on my arrival home from the clinic. The change from being “Obruni,” meaning white person in Twi, to Sara. Having my two year old friend meet me on the porch of the house after work, handing me flowers, and jumping into my arms. “Have you ever ran before? Because your about too!” and running from the tro-tro to the house after being caught in a rainstorm. Creating a Macarena/Azonto compilation. Loading my luggage into the taxi on my last day in Jukwa, with all of the children huddled on the porch, asking me questions in Twi and hearing Maggie’s translation, “But when will you come back? You will go and come back?” and being able to reply in my newly learned Twi with “Yes, Mere ko bra,” I go and come back.